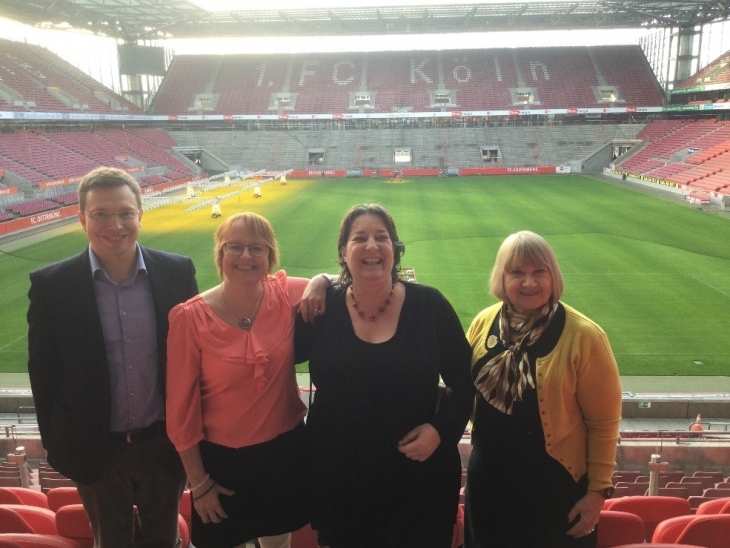 Lorna McKee has just returned from an interesting trip to the German Sport University Cologne furthering the collaboration with Professor Holger Pfaff of the Institute of Medical Sociology, Health Services Research and Rehabilitation Science (IMVR). Professor Pfaff is an Honorary Senior Research Fellow in HSRU and has spent two extended periods in Aberdeen in 2014 and 2015 funded by a RSE/ Caledonian Visiting Fellowship. During her visit to Cologne, Lorna was attending the launch of a major project on Health Literacy in the Workplace 2015 - 2018 where she serves as a Member of the International Project Advisory Board. The project involves a novel partnership between the German Sport University Cologne, IMVR and the University of Cologne Health Economics Department, School of Medical Sciences. It is funded both by a consortia of private and public organisations and has a range of sub projects which include studies of managers’ support for health literacy; interventions for 'at risk' employees and web App advice for young office trainees. The ' Kick Off ' meeting involved over 120 project stakeholders, including major companies and was opened by the Minister for Health. It was held at the Cologne premier league football stadium. Lorna will be providing ongoing advice and support with a special focus on developing the group of independent young scientists involved in the project. Lorna also spent time working with Professor Pfaff and his colleagues at IMVR on developing the full application of a shortlisted project bid on building research capacity networks with a focus on vulnerable patients. This project aims to identify and improve the care transitions of patients at the end-of-life and those with coronary disease with mental health risks. Professor Lorna McKee has just returned from a very successful visit to the Institute of Medical Sociology, Health Services Research and Rehabilitation Science, (IMHR) at the University of Cologne, Germany. IMVR is a joint scientific institution at the Faculty of Human Sciences and the Faculty of Medicine (School of Medicine) at the University of Cologne with the core mission to deliver knowledge to enhance care and health’, with a primary focus on two areas of research, care , context of care and quality’ and ‘organisations, work and health’ . Lorna was the guest of Professor Dr Holger Pfaff, Institute Director, for a two week period and was involved in delivering an intensive teaching programme on two themes, ‘Undertaking Interdisciplinary Research’ and ‘Conducting Mixed Methods’ research in the context of health services and health care research. The teaching spanned two consecutive weekends and was delivered to a group of Masters level students studying Rehabilitation Sciences. The students were expected to develop a well-evidenced, mixed methods research proposal which drew on their learning during the workshops and to make a presentation of their ideas on the final day of the course. The visit also provided an opportunity to consolidate existing links between the HSRU and IMVR and to build on collaborative research with Professor Pfaff around the themes of social capital and health organisation performance and quality. Professor Dr Pfaff spent the month of August 2014 in HSRU funded by a fellowship from the Royal Society of Edinburgh/ Caledonia visiting researcher scheme. He will return to Aberdeen in March 2015 to continue to develop both research and teaching interfaces and opportunities. Lorna’s visit was supported by a competitive award from the International Scholars/ Guest Professorship Scheme administered bythe University of Cologne, International Office. During August, the Health Services Research Unit (HSRU) has hosted a research visit from Professor Dr Holger Pfaff from the University of Cologne, Germany. 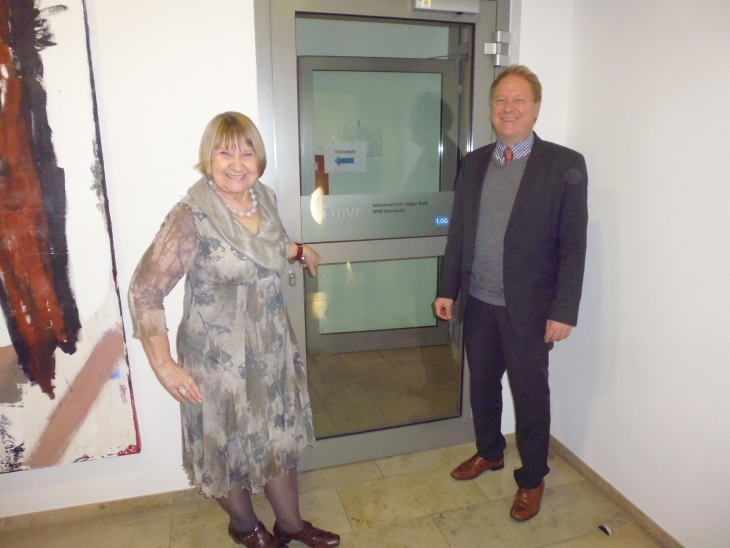 Professor Pfaff has been chairman of the German Network Health Services Research (DNVF) between 2006 and 2014 and is director of the Institute for Medical Sociology, Health Services Research, and Rehabilitation Science (IMVR) of the University of Cologne since 2009. This "bridge institute" is a joint institution of the Faculties of Human Sciences and Medicine. Since 2009, he has held the professorship Quality Development and Evaluation in Rehabilitation, which is responsible for the teaching fields Medical Sociology (Faculty of Medicine) and Quality Development in Rehabilitation (Faculty of Human Sciences.) Professor Pfaff is also a committee member of the German Science Foundation, a major research funding organisation. Professor Pfaff's research focuses on three interconnected areas: health services research, social epidemiology (sociology of health), and healthcare system design. 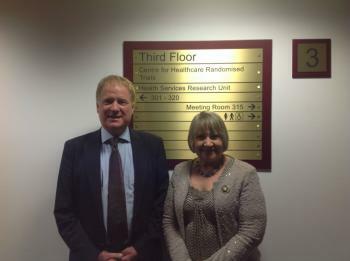 His research visit has been led and coordinated by Professor Lorna McKee, Director of the Delivery of Care Programme in HSRU and supported by an RSE/ Caledonia visiting fellowship. During his 4 week stay he has worked closely with Professor McKee, co-authoring a publication on social capital and developing other linkages with colleagues within HSRU. There are plans to build mutual research training exchanges between the Universities of Aberdeen and Cologne to enhance capacity of health services research in both places. Discussions about future research collaborations on specific projects comparing health systems and coordination principles have also been central to the visit.